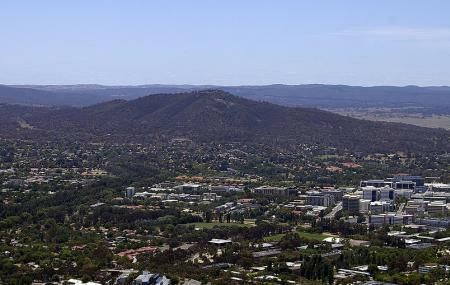 The Mount Ainslie with an elevation of 2766 foot is nestled in the Canberra suburbs bordering Ainslie, Hackett and Campbell. Located within the Canberra Nature park, the hill is named after a nineteenth century settler James Ainslie. The highlight of the park is the tourist outlook that offers stunning vistas of the Black Mountain and the Red Hill, especially during the time of sunset. You will also find the Air Beacon at the summit of the Mount Ainslie which guides the airplanes near the Canberra Airport. From the Australian War Memorial, you can access the Kokoda Summit Train that bears the plaques speaking about the battles in Kokoda Trail during the World War II. It's a great walk up, takes about 40+60 minutes for moderate to slow pace. It's a nice mostly paved path up with a few steps towards the end. Great view of Canberra, the war memorial and parliament house at the top. There's also a water fountain at the top, which is handy. If you don't like walking you can cheat and drive up. There’s a tap to refill your water bottle at the top of Mount Ainslie. It’s located near the park benches at the lookout. There are no toilets at the lookout. No shelter. There is car parking at the lookout. Excellent views of Canberra and the Australian Capital Territory. One of the best places in Canberra for bushwalking/hiking/trail running. Very well marked out track which is user friendly as well. Recently has been rolled out so that there are less rocky surfaces.